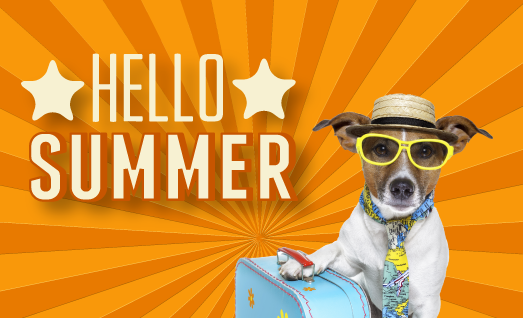 Hubble & Hattie: Hello summer! It may have come to your notice that it’s SUMMER! Yes – that big golden-orb-in-the-sky that you dreamed about over winter has finally put in an appearance! For us humans, it’s usually a time to get out and enjoy the fine weather and long days. For us pet owners, it’s a time when we can spend more time outdoors with our animals, whether in our gardens, or out in the wilds. To help you help your animals, we’ve created a list of things to keep in mind when out – or in – and about with your dog or cat. At least, that's what you should be thinking. With longer, warmer days comes an increased risk of dehydration. On very hot days, (yes, we do have them), simply sitting in the sun is enough to dehydrate us. 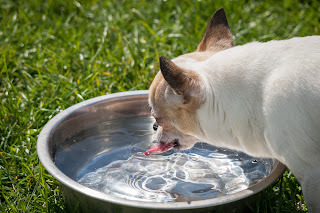 Whilst dogs and cats don’t sweat like we do, they still lose water through panting, and sweat through their paws, and they can still become severely dehydrated. So, tip number one is to be alert and ensure your pet always has access to plenty of clean drinking water. That’s always, folks. And if it’s SUPER hot, slip a few ice cubes in the bowl, too! Just as important as water when the sun is out, it’s imperative that your animals have access to a shaded, cool area, where they can retreat to out of direct sunlight whenever they wish. 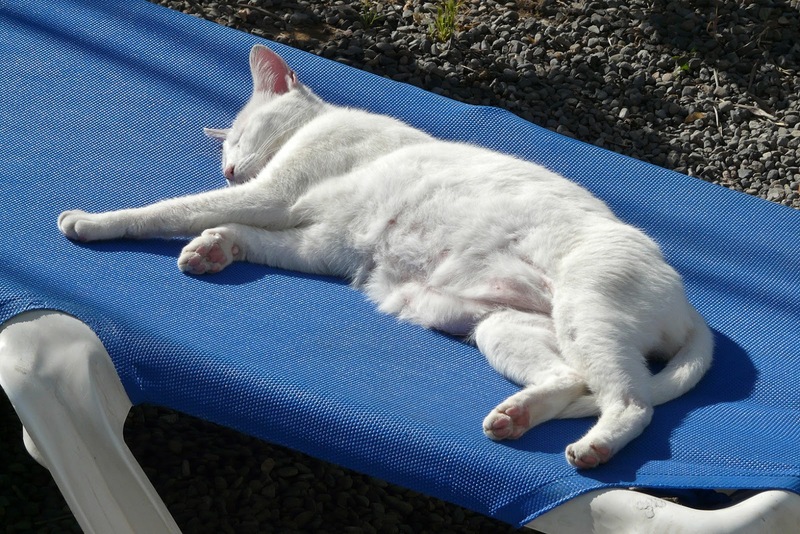 This is particularly important for cats, for whom shade-seeking is an important strategy for coping with hot weather, along with reduced physical activity … no, they’re not simply being lazy in the hot weather! If you have a couple of pets, they may want stay close to one another, but make sure that there’s enough room for them to space themselves out a bit: huddling together will increase their body temperature. Some pets, particularly older ones, like to fall asleep in the sun, and may not move into the shade unless woken. If you think your pet is about to snooze in the sun, move them into a shaded, cool area, or indoors. Of course, even indoors temperatures can soar, so ventilation is vital. Keeping windows open to enable a flow of cooler air is a good start: screens can be used if you’re concerned your pet could make off, or if you live in an urban environment. 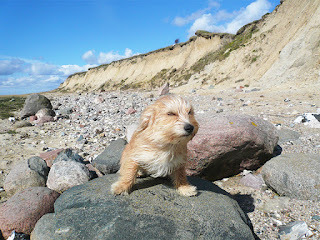 Cooling fans are also a good idea, although some animals can be irritated by the constant breeze. Try placing a fan near a window to direct air into a room, rather than onto Fido’s bed. If you’re on a public beach, or out-and-about, shelter may be difficult to find, and whilst we can slip on a t-shirt or hat, for our furry friends, it’s not so easy. 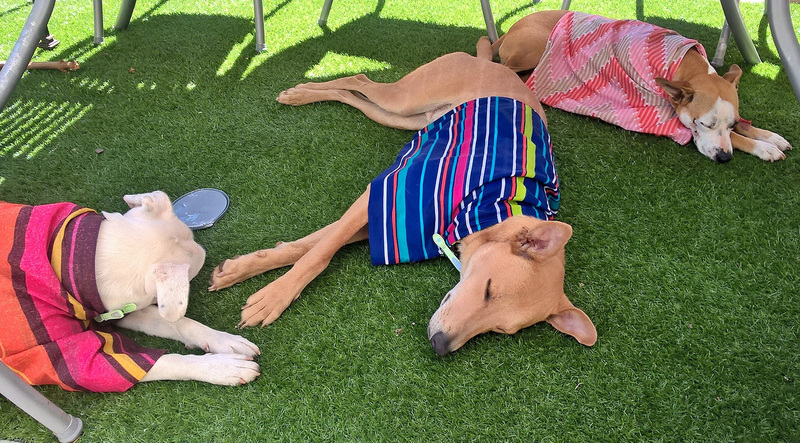 Clothing to shade your pet from the sun is a particularly good idea for smaller dogs – but be especially careful this doesn’t make them hotter! No doggy clothes? Sunscreen or wipes are the way to go. If your pet has white or pale fur, they’re likely to have pink skin, too, and this will catch the sun more easily. Cats with white ears are particularly prone to cancer on their ears precisely because of this, and dogs are no exception (I even know of a horse that needed to wear sunscreen), so a little application of sunscreen, either as a spray, cream, or wipe, on any pale areas is a good way to prevent sunburn in your pooch or kitty. Or horse. You should talk to your vet about an appropriate sunscreen for your pet (a number are available): NEVER USE HUMAN SUNSCREEN, as this contains zinc oxide which can be lethal to pets if ingested. 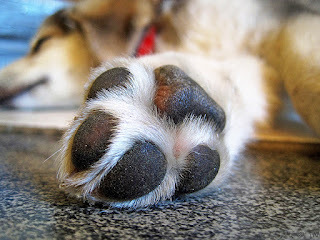 If you’ve ever walked barefoot on the pavement on a hot summer’s day, you’ll know how scorchingly hot it can become, so spare a thought for a dog’s paws. One evolutionary theory says dogs evolved in freezing, arid conditions, so whilst they're adapted very well to the cold and dry, hot and dry climates are more challenging. Whilst contact burns from sun-baked asphalt are uncommon, dogs with more sensitive pads, such as those with immune or skin conditions, are more liable to get a physical burn. The biggest issue, though, affecting all dogs is body temperature. Dogs have a dedicated thermo-regulatory system in their paws that moves colder blood from the pad to the body, where it warms up again. In hot weather, this mechanism can cause a dog to overheat simply by walking on a hot surface, no matter how big or small their paws are. Keeping your dog off dark, hot surfaces is the best way to help here, or limit walks on asphalt to the cooler times of the day. Keep in mind, too, that asphalt temperatures continue to rise for a while after the hottest time of the day, so early morning or evenings are good times for walkies. Or you could buy him some doggy boots. We’ve all seen people jogging along with their dogs in hot weather, and whilst wild dogs can run for a looooong time in extreme cold, and even extreme heat, jogging along with their owner on a hot sunny day is a completely different matter to being in the wild. You may enjoy a sprint in the sun, but for Fido, it could turn into a very nasty, or even fatal, experience. With an owner 'in charge,' many pets will jog along until the point of collapse if you’re not careful. The best advice in hot weather is don’t make your dog exert himself. If you need to go for a run or cycle, leave Fido at home until the weather cools down … just make sure you’ve read Summer breeze, above! When the truly scorching weather hits us (fingers crossed … ), it’s often all we can do to go out into the garden and sit in the shade. If you’re active, though, many dogs simply can’t resist joining in the fun, and if you’ve a kiddy-sized paddling pool, it can be a great way for everyone to have fun together, let off some steam (literally), and keep cool at the same time. 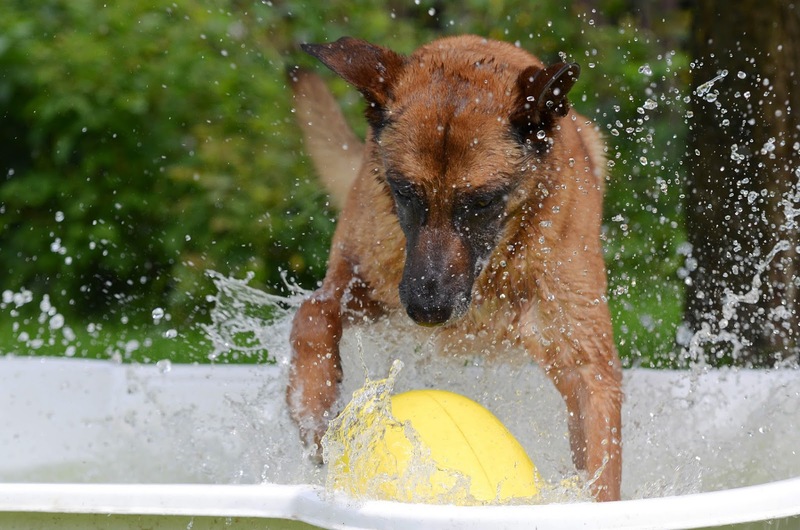 Just make sure you don’t overfill it – not all dogs are naturally good swimmers! Board shorts are optional … and don’t use the hot tub. Your pet is an amazing animal, and nature has given him the ability to know when and how to keep cool in most conditions. But keeping the above points in mind will make sure that your animals are comfortable, and can enjoy the hot weather. Above all, be vigilant. Remember that many animals love the sun just as much as we do, and sometimes may do a little too much, particularly when it's absent for so much of the year! Keep the above pointers in mind, and you’ll ensure that your animal companion doesn’t suffer in the sun. Oakfield - Life begins at 14!